We are back on the road and that means a Travel Thursday post. 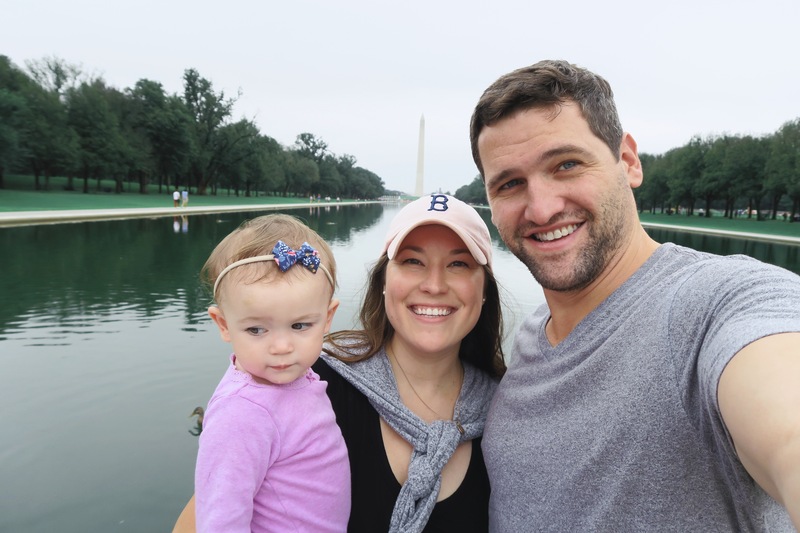 Tim & I have both been to D.C. but this was the first time tackling the city with a little one. Sharing some of our trip highlights and some tips if you plan to travel there with your little. We stayed at Pohick Bay Regional Park Campground 30 miles South of the city. We loved the campground. Our site’s “backyard” was the playground which was perfect for us. There were several activities put on by the camp and we got to see a turtle eat a worm and then bailed when they started feeding mice to a snake… but the dad’s were impressed. It rained but if it hadn’t there was also a s’mores and movie night on the lawn. The showers were fine. All the folks staying there were very friendly and it was a great family friendly environment. They also have a waterpark on the property during the summer and it’s very dog friendly. My sister who is getting her masters in DC was able to visit with us for a few days and Evelyn was in heaven. On the second day we found 3 hour street parking and walked the National Mall. We parked along the Potomac near the Lincoln Monument and then slowly walked our way to the museums. When we got to the Smithsonian Museum of Natural History Evelyn and I played in their kids interactive room and Tim rented a bike, biked about 20 minutes back to the truck and drove the truck to 3 hour street parking right in front of the museum. The kids playroom had a lot of interactive things for kids to explore, Evelyn was too young to really enjoy any of it. But for kids 2+ it would be perfect. There is also a great selection on brightly colored fish in fish tanks and large models/skeletons of dinosaurs and mammals. There’s a hot dog stand right outside the museum to grab a quick and inexpensive lunch. Also, you have to go through security and it says no food or drink but we went through with two lunch bags of food and drink and no one stopped us. Next we went to the Smithsonian National Museum of American History. I wanted to see the collection of all the First Ladies Inauguration Ball Gowns. This place turned out to be the secret winner and unfortunately we got there when it was already late and Evelyn was over it. But I would highly recommend it. Also, their kids play room looked amazing with way more climbing options and less fragile looking displays. It is closed on Tuesdays and we went on a Tuesday so we weren’t able to go in.